The barber offers 10 types of haircuts, 4 for men, and 6 for women. This is how a barber shop should look like in an underground vault during the post-apocalypse. I doubt a barber shop would be first priority to get up and running, but then again, vanity often gets first in line, even in emergent situations. This particular barber offers 10 types of haircuts. 4 for men, and 6 for women. I’ve always liked games that has small objects one can move around as one would like. Kind of looks like a barbershop, huh? Albeit a modest one (the nukes went off, what can you expect, right?). 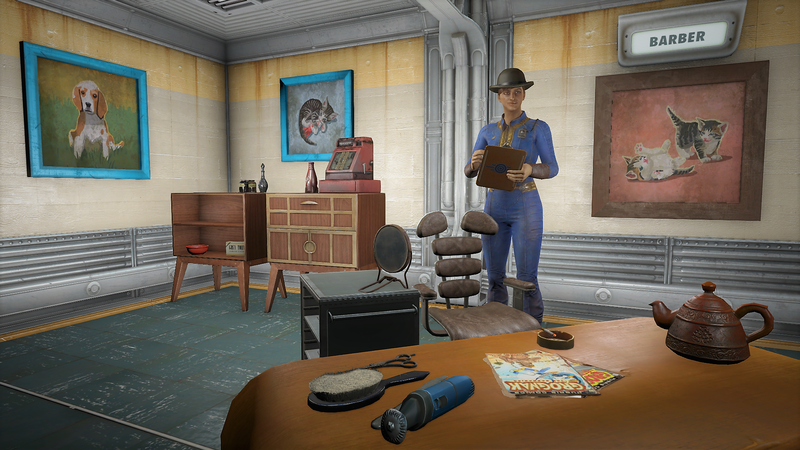 Any vault that doesn’t make a barber shop high priority is not a vault anyone should live in my fine reporter. Vanity after safety but before comfort.